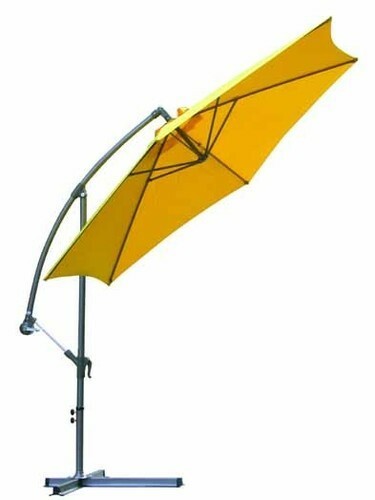 Backed by our highly experienced team of professionals, we are offering a wide collection of Side Pole Umbrellas. Designed in compliance with international norms of quality, these are manufactured using high grade fabric and sophisticated technology. We have created a virtual impact among the clients due to our unique, attractive and eye-catching range. Our team members have the ability to craft out these umbrellas in form as per the taste and preferences of our clients. After a modest start, "One Step Furniture" is now one of the reputed brand in Garden, Outdoor, Cafe & Canteen Furniture. We are also known for our innovations, quality and creative designs. We supply, wholesale, and trade an extensive range of furniture catering to the needs of home,corporate & hospitality sector. Our furniture are high in demand among Homes, Offices, Hotels, and Resorts for their comfort and aesthetics. Established in the year 2008, we, "One Step Furniture" are engaged in the supplying, trading, and wholesaling of a wide range of imported furniture. These furniture are aesthetically appealing, highly comfortable and are available with different & creative designs & styles. Our supplied furniture are ideal for both indoor and outdoor spaces and are extensively used in homes, hotels, resorts and offices. Designed using Wicker Cane, Synthetik Cane, Poly Wicker Cane, Aluminium, Stainless Steel ,hardwood, softwood, veneers, and iron, our furniture stand tall on all quality parameters. We offer Home & Office Furniture like outdoor furniture, office furniture, hotel furniture, residential furniture, lounge chairs, bedroom set. All our business activities like the administration, finance, marketing, import and advertising are professionally managed by our different departments. We have association with some of the most renowned vendors from all over the globe, who supply us with modern and comfortable furniture. We also strive to maintain cordial associations with our clients by assisting them in making the right selection of furniture and delivering their placed orders on time. Due to all these reasons, we have been able to carve a niche for ourselves in this industry. Our mentor, Ms Preeti Singh is the guiding force behind the success of our business ventures. shes business acumen and ethics have motivated all the employees to work hard and achieve the organizational goals and objectives. It is due his rich industry insights that we have been able to garner a large network of clients in Indian Subcontinent. We are the Direct Manufacturers & Wholesalers & Importer of Furniture. We made all kinds of Home, Cafe, Office, Indoor & Outdoor Furniture. We offer the Quality furniture at the Best price range. Our furniture is goes through strict quality checks at the time of Manufacturing and dispatch. So you can be rest assured of the Quality as Promised. We offer Free Home Delivery to our client in anywhere in Mumbai. Walking The extra mile we offer the best After Sales Service and value the clients Patronage.